Fòs Ayeryen Swis la (Alman: Schweizer Luftwaffe; Franse: Forces aériennes suisses; Italyen: Forze Aeree Svizzere) se konpozan lè pou Fòs Ame Swis la. Se etabli nan 31 jiyè 1914 men pat vini sèvis apa pandan lane 1936. Nan 1 janvye 1996, li vini sèvis endepandan apa d lame. Fòs Ayeryen Swis la gen uit (8) baz avèk Payerne kon plis enpòtan baz la nan Swis d Lwès. Lòt baz ankli baz elikòptè nan Alpnach, yon baz ki pa aktif nan Buochs ak baz nan Bèn, Emmen, Meiringen, Sion e Locarno. Fòs Ayeryen femen baz nan Mollis pou janvye 2007 e li pral fè pi piti baz nan Alpnach. Oerlikon 35 mm twin cannon AAA gun 45 a.k.a. 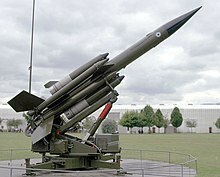 "Flab Kanone 63/90"
Rapier missile surface-air guided missile 54 a.k.a. "Mobile Lenkwaffen Flugabwehr"
Aérospatiale Alouette II observation, rescue & liaison II 30 1958 1992 10 bought in 1958, and 20 in 1964. Aérospatiale Alouette III transport & trainer III 84 1964 2010 14 lost in accidents. Replaced by EC635. BAE Hawk trainer T.66 19 1987 2002 One lost in 1990. 18 sold to the Finland in 2008. BFW M.18 transport 18C & 18D 4 1929 1954 1 18C, 3 18D. Bücker Jungmann trainer Bü 131 94 1936 1971 Two seat biplane. 10 impressed from aero clubs. Bücker Jungmeister trainer Bü 133 52 1937 1968 Acrobatics/air combat training single seat biplane. Dassault Falcon VIP transport 50 1 1996 2013 Replaced by Dassault Falcon 900EX. fighter IIIS 36 1964 1999 Swiss IIIC, Upgraded by SF Emmen in 1988. Financial scandal reduced orders from 100.
advanced trainer IIIBS 4 1964 2003 2 lost in accidents. advanced trainer IIIDS 2 1983 2003 Replaced crashed Mirage IIIBS. de Havilland Mosquito bomber PR.4 & FB.6 2 1944 1954 1 used by Swissair for pilot training. Modèl:Ordinal was engine testbed for EFW N-20. de Havilland Vampire fighter F.1 4 1946 1990 First Swiss Air Force jet aircraft. For testing. fighter-bomber F.6 178 1949 1990 Includes 3 from spare parts. night fighter NF.10 1 1958 1961 Testing only. trainer T.55 39 1953 1990 Two seat trainer, 30 built in Switzerland. de Havilland Venom fighter-bomber FB.50 126 1954 1984 Improved Vampire with new wings. Swiss FB.50 = RAF FB.1, FB.54 = FB.5. N-20.2 Arbalète experimental fighter N-20.2 1 1949 1952 First Swiss designed jet fighter, only 1 test aircraft built. N-20.10 Aiguillon fighter N-20.10 1 1949 1952 First Swiss designed jet fighter, not in serie produced. EKW C-35 reconnaissance C-35 & 35-1 90 1937 1954 8 built from spares. EKW C-36 reconnaissance C-3603 160 1942 1987 20 converted to target tugs, 40 re-engined with turboprop. FFA P-16 ground attack P-16.04 & P-16 Mk.II 5 1955 1960 Prototypes. Order for 100 cancelled after Modèl:Ordinal crash. 2 returned to FFA. & ambulance C-3 Trop 5 1940 1963 Number includes 1 impressed. Hawker Hunter fighter-bomber F.58 100 1958 1994 Swiss F.58=RAF F.6, FB.58A=FGA.9, T.68=T.66. 3 batches, some converted ex-RAF F.6s. Junkers Ju 52/3m transport Versions 3 1939 1981 Since 1983 museum aircraft at Dübendorf. Modèl:Nobreak fighter MS.406 2 1939 1954 Trainer after replaced as fighter in 1948. 17 3801s built from spares after production ended. North American P-51 Mustang reconnaissance P-51B-10 1 1944 1945 Some bought surplus for $4000 US ea. North American Harvard trainer Mk.IIB 40 1948 1968 Surplus ex-RCAF (Canadian built). Pilatus P-3 trainers P-3 73 1956 1995 Number includes prototype. Rockwell Grand Commander mapping 680FL 1 1976 1993 Civil registered for Federal Office of Topography. Siebel Si 204 transport D-1 1 1945 1955 Interned. Sud-Ouest Djinn trainer S.O.1221 4 1958 1964 Returned to manufacturer following rotor problems. Oerlikon 20 mm cannon 1937 1992 (L Flab Kan 37). Oerlikon 20 mm cannon 1954 1995 (L Flab Kan 54 Oe). A number of air defence systems have been offered by Swiss companies and trialled by the Swiss Air Force but in the event not purchased. Mowag Shark 1981 1983 with French Crotale (missile)<bror British twin AAA "wildcat"2x30mm. 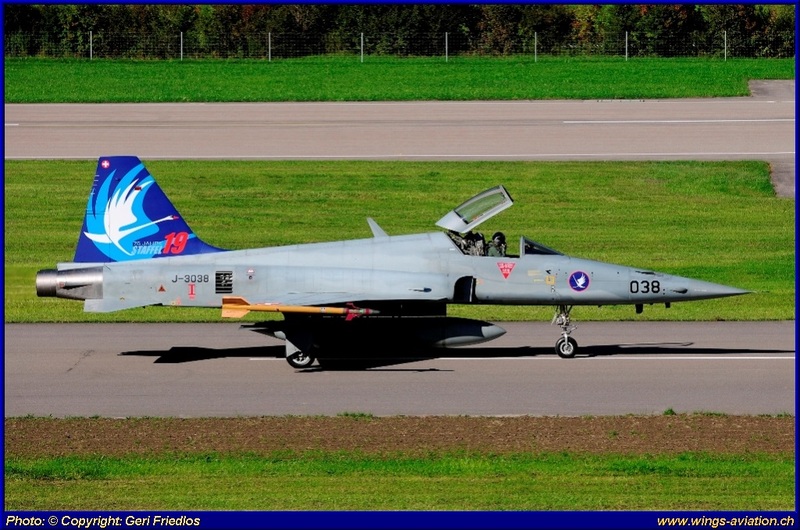 In the Swiss Air Force an aircraft is usually not deployed permanently to a given Squadron, especally that of the [milizia] pilots who spend just a few weeks a year in service. Aircraft are used across several squadrons, even the Squadron leader's aircraft such as the F/A-18C J-5017 from 17 Squadron will be used by used other squadrons. Older aircraft will often be retired from front line service to support squadrons, for example the Hawker Hunter from a fighter-bomber with 5 Squadron to [Zielflugstaffel] 12 as a target tug. ↑ "World Air Forces 2013". Flightglobal.com, 11 Desanm 2012. Paj sa edite a 10:55, 2 fevriye 2019.